How did I miss this book when I was younger? It’s like a slighter darker version of Anne of Green Gables, and I loved every second of it. 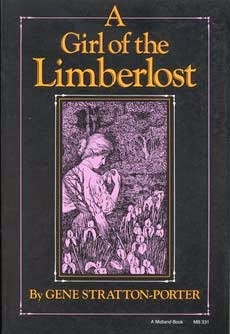 Published in 1909, the story is about a young girl named Elnora who lives in the country. She is going to high school for the first time, but her lack of social skills and money makes the way difficult. Her whole life has been spent on her farm with her cold, unloving mother. Her father died in the Limberlost swamp the day she was born and her mother has resented her ever since. Elnora is such a unique character. She is stubborn and driven to succeed. She's fiercely intelligent but incredibly compassionate. She is patient, giving her mother the benefit of the doubt for years. She's a hard worker, willing to make money to achieve her dreams. She has self-respect and is willing to sacrifice in order to find true happiness. She reminded me a little bit of Jane Austen’s Lizzy Bennet, particularly in a scene where one woman comes to talk to her about her possible engagement. There is so much I loved about this book. There's a fantastic female lead who isn't just trying to win a man. The plot focuses on relationships with her family and friends and pursuing her dreams. She stands up for herself even when she doesn't fit in. She's a problem solver and isn't overwhelmed when a slight obstacle gets in her path. Kate Comstock, Elnora's mother, is a fascinating character. She’s so oblivious to the pain she causes her daughter because she’s trapped in a prison of grief. She has one of the most drastic changes in attitude and overall character development that I've ever read. The way it's done it's completely believable, but it's still a 180 and it was so satisfying to see her relationship with Elnora change throughout the book. I love how the romantic aspect of the story played out too. Elnora protects her own feelings and isn’t swayed the moment Philip gave her a second glance. She waited until she was sure he didn't want anyone else and she was not just a consolation prize. That’s so unusual to find in a novel, especially one written more than 100 years ago. She wanted someone who loved her deeply, not someone who settled for her in a moment of passion. BOTTOM LINE: I fell hard for this novel. Elnora is so determined and intelligent, she’s definitely become one of my new favorites. The book is chocked full of wonderful characters, including her Uncle Wesley, the young ruffian Billy and even her selfish, detached mother becomes a character you care about. BONUS: This is a Hoosier classic set in the Limberlost swamp that is in northern Indiana. I visited the author’s home after finishing the book and will post on my trip! I've never read this but for some reason have read something about it recently elsewhere. It definitely sounds like something I would like as well. My grandmother, who hardly ever talked about books, told me that this was one of her favorites when she was a girl, and that made me want to read it. She also gave me the first two Anne of Green Gables books. I love this one as well, & I still have a copy of it. Her mother is so awful through the first half, and her transformation is a delight. I haven't enjoyed the other books of Gene Stratton Porter's that I have tried though. This is the book Lila Ames fell hard for in Gilead. Her husband brought it home to her and she just sank into it. Ever since then, I've wanted to read it. It's TBR'd on my Kindle. A slightly darker version of Anne of Green Gables - that definitely got my attention! I'll have to check this one out. This is one of my favorite novels ever; it's difficult not to fall in love with it. I actually scored a first edition of it for only $4 at a little bookstore that somehow overlooked it! Lisa - That's good to know about Porter's other books. I was wondering if I should try some of them. Susan - You're right, I can't believe I didn't make that connection. I just read Gilead last year. Belle - I hope you love it! Elisabeth - That's awesome! I bought a 1916 edition for $6 at a used bookstore and it's just gorgeous. Literate Housewife - It's so much fun to return to old favorites!